Dale Witham – General Fishery Manager and Chief Smoker! Dale Witham is ready to deliver another load of smoked fishIf you must smoke…smoke fish! 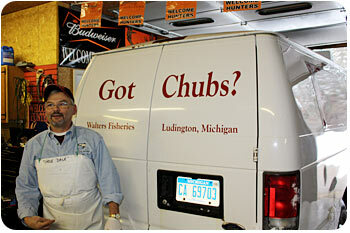 That’s the motto of Walters Fishery in Ludington, and they do a lot of it. Many Michigan fish processors smoke fish, either for the wholesale or retail market, but it’s Walters’ exclusive focus. The “Old World” method of natural hardwood smoking lends a special savory hickory taste to Great Lakes whitefish, and they tap three generations of experience to produce the delicacy. According to Walters’ general manager Dale Witham, they carefully select and hand craft each batch of fish. They use no supplementary flavorings such as brown sugar or molasses. Instead, they let the cherry, maple, and hickory wood chips do the work and create the finished product’s distinctive aroma and flavor. 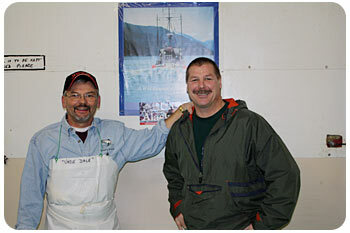 Witham is especially proud of the comment by an Alaska seafood expert that Walters’ golden smoked whitefish product is better than Alaska salmon. He’s also proud of complying with state regulations and implementing their federally required Seafood Hazard Analysis and Critical Control Point (HACCP) process. The focus on standards comes naturally to Witham, a former quality assurance specialist for a medical equipment firm and for Hunt-Wesson Foods. “It’s really important to produce a consistently high quality product,” he says cheerfully. Witham runs the operation for Walters’ owner George Shrink, who bought it from Ron Walters, a second generation fish smoker. Shrink, who fishes with Witham’s nephew, lured “Uncle Dale” (as he prefers to be called) to lend his quality control expertise to build the business. In addition to his professional experience, Witham grew up working in the meat department of his family’s Thriftway grocery store in Muskegon. A large portion Walters’ smoked fish business is to wholesale markets within a 100 mile radius. At their walk-in location in Ludington, local customers are on an honor system, where they deposit money in a slot and take their fish. Witham likes it that way, appreciating the loyal, honest folks who patronize their product. He also foresees a growth in cyber sales, as customers from all parts of the country can access the flavor of smoked Great Lakes whitefish. The work days are long, but Witham’s contagious enthusiasm for educating people about the benefits of eating fish sees him through.